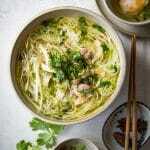 Pho Ga (Vietnamese Chicken Noodle Soup) is one of the classic dishes of Northern Vietnamese cuisine. Light yet flavorful, simple yet sophisticated, this fragrant noodle soup can warm your heart and soul. 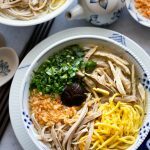 I will share with you how to cook authentic Pho Ga Hanoi with natural, real ingredients, as well as how to serve and eat it like a Vietnamese. Instructions for traditional stovetop method and pressure cooker method are included. “Pho” means rice noodles and “ga” means chicken. “Pho Ga” simply means chicken rice noodle soup. 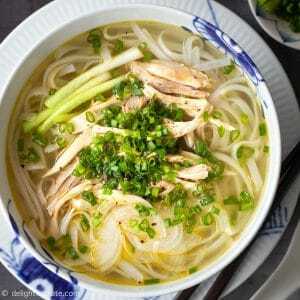 A bowl of pho ga consists of soft slippery pho noodles, sliced or shredded chicken meat and light and fragrant broth. Originated in Hanoi, it is the younger cousin of pho bo (beef pho). Despite being not as bold as beef pho, chicken pho has its own charms. Pho ga smells so good that you suddenly realize how hungry you are. It is still light enough that you will not feel overloaded or guilty even after savoring a huge bowl. Before we get to how to cook it, I thought it is important to point out characteristics of a delicious bowl of chicken pho. First of all, the broth must be clear, light, flavorful with a golden color and fragrance from ginger and spices. The sweetness of the broth should come from gently simmering chicken bones. You should not need to add sugar or MSG to season the broth. Besides, the fragrance from pho spices shouldn’t overwhelm the chicken flavors. 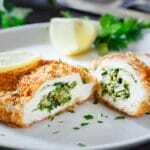 The chicken meat should be tender, moist and juicy. It should still retain the right amount of firmness – a sign that the meat is just cooked through. Overcooked, fall-off-the-bone and flavorless chicken meat has no place in a bowl of authentic pho ga. I have been playing around with this recipe for months, making it every week and experimenting with different spice blends and ratios of ingredients. Finally, I came up with a version I’m happy with to share with you today. Please feel free to tweak it to your likings though :). To cook pho ga, you will need a whole chicken or a combination of chicken thighs, breasts and chicken parts with bones (such as chicken backs and necks). You will also need shallots (or onions), ginger and spices for the broth. I find that pho broth in Vietnam has a more pronounced ginger fragrance than Americanized pho. So be generous with the amount of ginger. 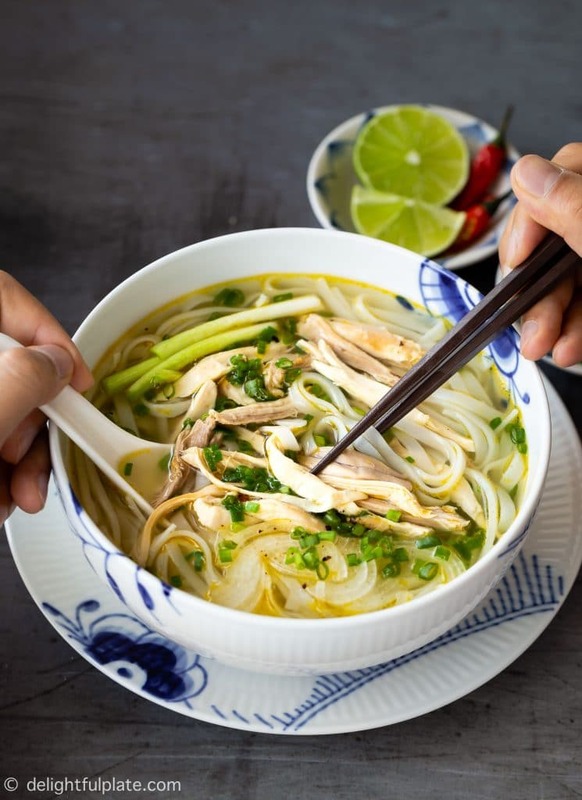 If you find your pho broth too bland, chances are you either did not use enough chicken bones, did not simmer long enough or added too much water. I personally think there is no need to add rock sugar which artificially sweetens the broth, but I’ll leave it up to your taste to decide. I also don’t like adding an apple to the broth like a lot of recipes do. It makes the broth taste totally weird and not like chicken pho broth at all, in my opinion. Since chicken flavor is so light and delicate, I find that it is better to use shallots than onions. Onions are more pungent and sulfuric than shallots. If you cook pho ga on your stovetop, it’s fine to use onions if you don’t have shallots. However, if you want to cook it in your pressure cooker, please use shallots. From my experiments with my pressure cooker, onions make the chicken broth taste somewhat unpleasant with its sulfuric fragrance. 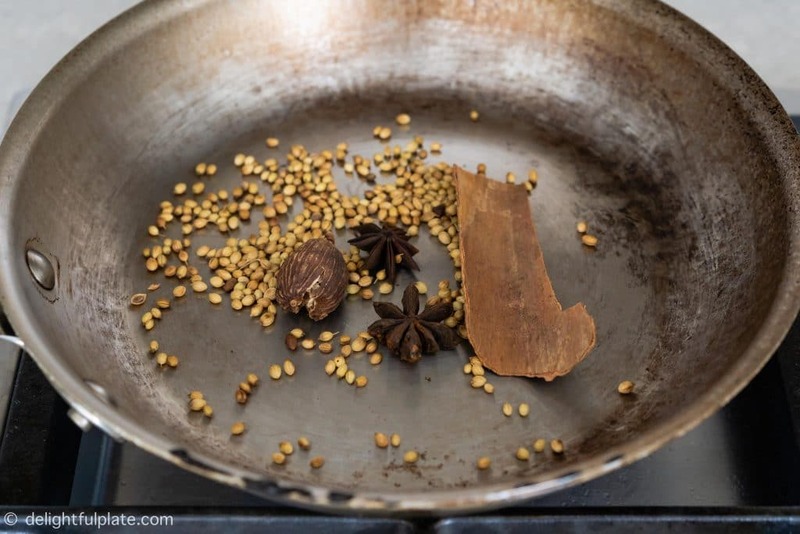 My favorite spice blend for chicken pho broth consists of cassia bark (or cinnamon stick), star anise, coriander seed, and black cardamom pod. Black cardamom pod adds a lovely sweet note, but you can skip it if you cannot find it. I also tried adding cloves but found that chicken flavor and cloves don’t go together. I also tried adding fennel seeds and they gave the chicken broth some kind of a herbal taste I wasn’t fond of. So just stick with cinnamon, star anises, coriander seeds, and black cardamom pods :). I also flavor the broth with some fish sauce. Make sure you add fish sauce at the very end. Don’t add fish sauce in the simmering stage because it can result in some sourness in the broth. Whether you decide to cook pho ga on the stovetop or in a pressure cooker, I strongly recommend parboiling the chicken first to get rid of impurities and unpleasant chicken smell. One more extra step you can do is to toast the spices and dry roast the ginger and shallots to give the broth more depths. However, this step is not as critical as blanching the chicken. I personally think stovetop is the best method to cook any kind of pho noodle soups. Slow and gentle simmering is what makes the magic happen. First, you should simmer the chicken with ginger, shallots, and spices until the chicken is just cooked through. Do not overcook or the meat will not have a good texture. Then separate the chicken meat from chicken bones and add the bones back to the broth. Continue to simmer for, ideally, 45-60 minutes at least or until the flavors are concentrated to your likings. I understand that the point of using a pressure cooker such as an Instant Pot is to cut down on cooking time, but we shouldn’t sacrifice the taste too much. Therefore, I strongly recommend doing pressure cooking in two stages. The first stage needs only about 3 minutes of pressure cooking to get the chicken fully cooked. Then we separate the meat from the bones and continue to pressure cook the broth with just the bones. If we don’t stop in the middle to get the chicken meat out, it will be overcooked. To be honest, for me, in order for the pressure cooker chicken pho to turn out as good as stovetop chicken pho, the amount of time I save is not very significant. People in Hanoi (and Northerners in general) serve pho ga plain and simple. We top the noodles with chicken meat, very thin slices of onions (I mean paper-thin), a good sprinkle of black pepper, scallions and sometimes julienned kaffir lime leaves. You may also add a few slices of birds-eye chili if you want some heat or add a squeeze of lime to your bowl. For scallions, separate the white and green parts. Thinly slice the green parts and add them to the bowl. With the white parts, quickly poach them in the boiling broth before adding them to your bowl. Finally, ladle the hot broth over everything and serve immediately. If you want to serve it in Southern style, you will also need some bean sprouts and more fresh herbs on the side. 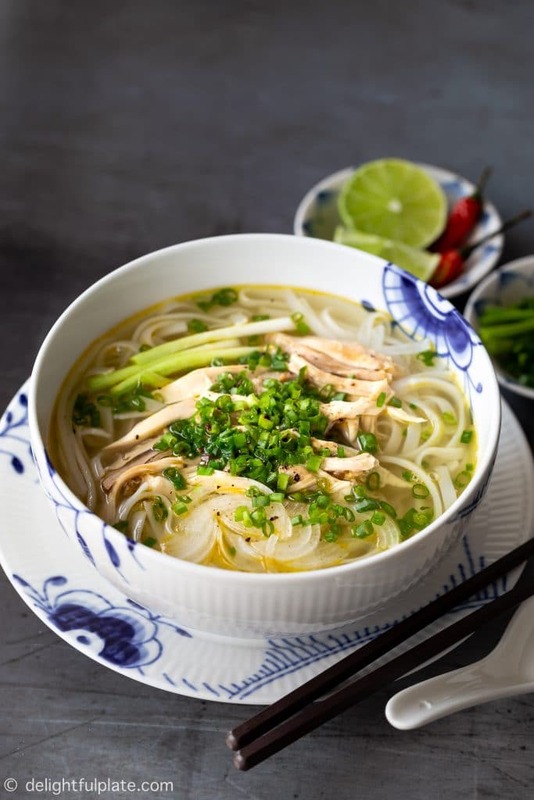 Pho Ga Hanoi (Vietnamese Chicken Noodle Soup) is a true classic of Vietnamese cuisine. Light yet flavorful, simple yet sophisticated, this fragrant noodle soup can warm your heart and soul. Add boiling water to a pot large enough to fit in the chicken. Add rice vinegar, pinch of salt and chicken to the pot. Let it boil for a minute, then remove the chicken and discard the liquid. 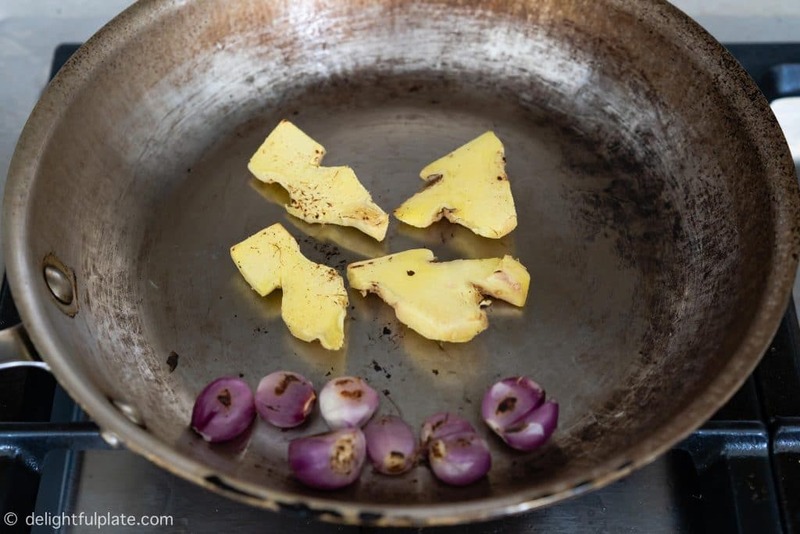 In a pan over medium heat, dry roast the ginger and shallots until fragrant and lightly develop colors. Set ginger and shallots aside. Reduce the heat to medium low. Add cassia bark/cinnamon, star anises, coriander seeds and black cardamom pod (if using) and toast just until fragrant. Be careful not to let them burn. Put spices in a spice pouch. In a clean pot, add chicken, ginger, shallots, spice pouch, 2 teaspoons of salt and 9 cups of water. When it starts to boil, skim off any foams and lower heat to a gentle simmer. Cover and simmer for 15-20 minutes or until the chicken is just cooked through. You can test by using a meat thermometer, or inserting a chopstick and see if the juice runs clear. Remove the chicken from the stock pot. Put the chicken in an ice bath to stop the cooking. Then take it out of the ice bath, separate the meat from the bones. Add the bones back to the pot. Continue to simmer the broth for 45-60 minutes, or more until flavors are concentrated to your liking. Before serving, taste the broth and flavor with 2-3 tablespoons of fish sauce to taste. Add 1 piece of ginger and half the shallots with the chicken to your pressure cooker. Add 2 teaspoons of salt and 6 cups of water. Close the lid and valve, pressure cook on High for 3-4 minutes (depending on the size of the chicken). Slowly release the pressure manually. Remove the chicken from the pressure cooker, put it in an ice bath to stop the cooking. Then take it out of the ice bath, separate the meat from the bones. Add the bones back to the pressure cooker. Add the remaining ginger, shallots and the spice pouch to the pressure cooker. Pressure cook on High for 20-30 minutes (the longer the better), and let it release pressure naturally. Once pressure cooking is over, taste the broth and see if you can add some more boiling water without diluting the flavors. Before serving, flavor with fish sauce to taste. While the broth is cooking, shred or slice the chicken into bite-sized pieces. Prepare pho rice noodles according to package instructions. Separate the white and green parts of the scallions. Thinly slice the green parts while quickly poach the white parts in the broth. Also slice the onion very thinly. 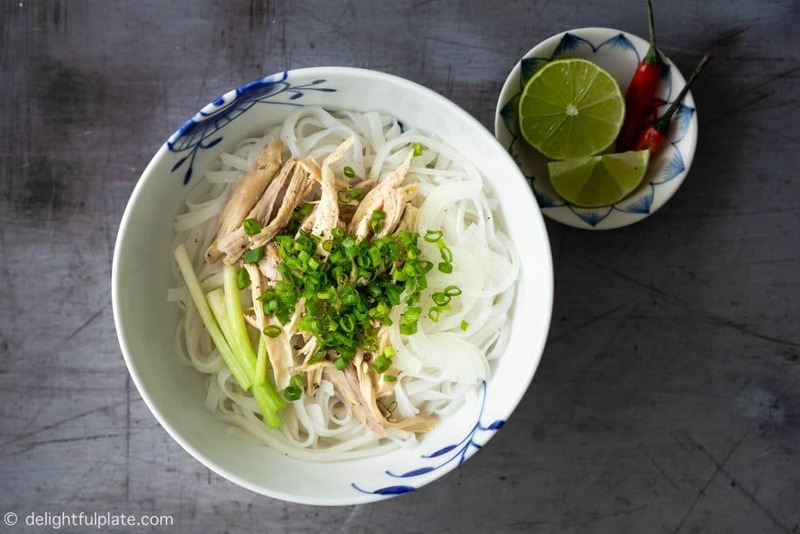 Add pho rice noodles to serving bowls, top with chicken meat, scallions and thinly sliced onions. Top with freshly cracked pepper. Bring the broth back to a boil and then ladle broth into serving bowls. Serve immediately with birds-eye chili and lime wedges on the side.